Pongal (பொங்கல்) is rice dish, either sweet or spicy, prepared especially for the ‘Harvest Festival’ (உழவர் திருநாள்) on the 1st day of ‘Thai’ (தை மாதம்), 10th month of Tamil calendar. Pongal generally refers to ‘ven pongal’ (வெண் பொங்கல்) and it is commonly made for breakfast. While sweet pongal (சர்க்கரைப் பொங்கல்) is prepared for festivals and other special occasions. 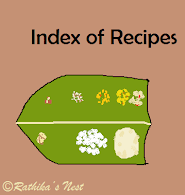 Pongal varieties are best made with freshly harvested raw rice (புது பச்சரிசி). Ven pongal goes well with brinjal kothsu, sambar or coconut chutney. Today let us see how to make ven pongal. * Some folks like pongal to have the natural whitish color. However, I prefer to add turmeric powder, which imparts a yellowish color to the dish. Method: Wash rice and dhal well in a vessel. Add 4½ tumblers (500ml) of water. Add in salt, pepper powder, cumin seed powder and turmeric powder and mix well. Now add peppercorns, cumin seeds and ginger gratings. Cover with a lid and pressure cook for 10 minutes or 10 whistles. Once the pressure subsides, remove pongal from the cooker. Heat ghee in a tadka pan or spice pan (தாளிக்கிற கரண்டி), add cashew nuts and fry till they turn light brown. Remove from fire and add to the pongal. Mix very well and serve hot preferably with ‘brinjal kothsu’(கத்தரிக்காய் கொத்சு).